Shire employees dedicated the day to promoting health, hygiene and education to students in the Nai Kiran Universal School, based in Ardee City, Gurgaon. The school does not have a building and operates in make-shift tents. The Shire team interacted with students and also spent time organizing all of the school's supplies in a nearby basement. 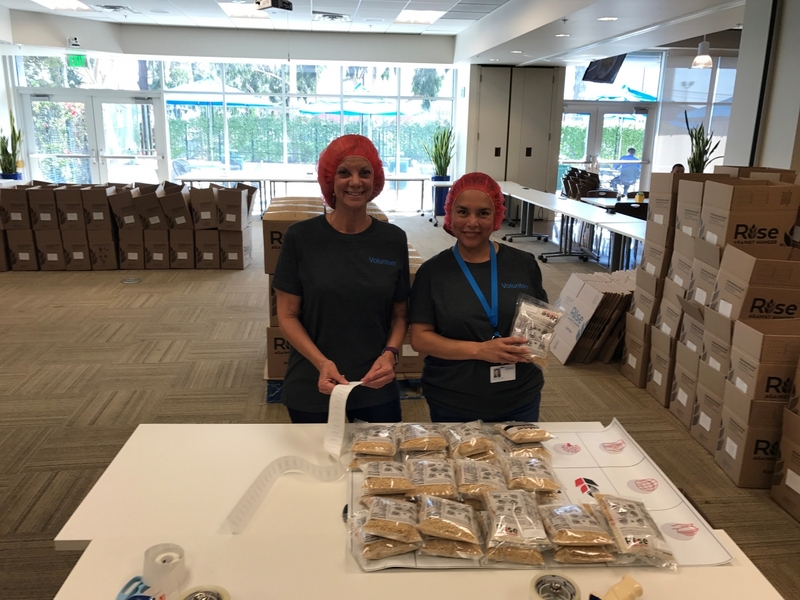 In LA, employees assisted with meal packaging for global distribution and hygiene kit assembly that were donated to The Midnight Mission and Ascensia, two homeless programs in the LA area. Volunteering for a non-profit organization, donating your time and talents for a cause, is incredibly rewarding and makes you feel good. Volunteering also brings people together. Since its launch in 2015, Shire's Global Day of Service has brought thousands of employees together each year from many parts of the organization and all around the globe. This special day, which fosters camaraderie and teamwork and builds on Shire's longstanding tradition of giving back to communities where employees live and work, is a cornerstone of our Responsibility commitment and an integral component of our employee and community engagement program. Shire held its third annual Global Day of Service in most locations on October 13, mobilizing employee volunteers from Singapore to Cambridge, Mass., and points in between, resulting in record participation and impact results. Teams big and small set out to accomplish whatever was needed most. From refurbishing classrooms in city schools to packing meals and building beds for the homeless, from cleaning hiking trails and conservation land to repairing and painting playground equipment, the Shire spirit reverberated around the world that day. Again this year, there was outstanding participation as employees gave back to the local communities where our BioLife centers are located. When all was said and done, more than 7,300 employees volunteered over 29,000 hours at 300 locations around the globe for causes that benefitted 250 partner organizations. Ireland: Through our partnership with SeriousFun Children's Network, employees were able to volunteer at the organization's Barretstown Camp in County Kildare, Ireland, which offers free summer camp for children with serious illness. With rakes and paint brushes in hand, Shire employees spent the day refurbishing camp grounds and painting cabins. India: Shire employees dedicated the day to promoting health, hygiene and education to students in the Nai Kiran Universal School, based in Ardee City, Gurgaon. 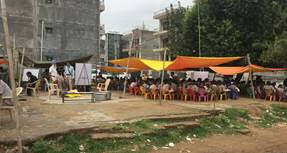 The school does not have a building and operates in make-shift tents. The Shire team interacted with students and also spent time organizing all of the school's supplies in a nearby basement. Los Angeles and Van Nuys, U.S.: More than 300 employees from the Los Angeles and Van Nuys Plants participated in projects at the site. Opportunities to volunteer were offered for all shifts, including swing and graveyard. Projects included dry meal packaging for global distribution and hygiene kit assembly that were donated to The Midnight Mission and Ascensia, two homeless programs in the LA area. In addition, another group of employees volunteered offsite at Habitat for Humanity warehouse sorting donated building supplies. Massachusetts, U.S.: A Shire team spent part of the day dismantling and then rebuilding a much-used wheelchair ramp at Cotting School (Lexington, Mass. ), which educates students with severe cognitive and behavioral challenges. Later that day, the team held a Health Fair for the students, reviewing health, safety and dental information.